In the blink of an eye, summer has come and gone. It may seem, all at the same time, your chances of enjoying a grand vacation have also vanished into the ether, but we guarantee you this isn’t true! You can still enjoy that big annual vacation, even in the early stages of fall. If you’re interested in relaxing in south Florida, the idea of taking a cruise may be just up your alley. Cruises from south Florida run fairly late into the year, meaning you can still sign up for them, even now. Here are some of your best options if this is your idea of the perfect vacation. The adorably named Coral Princess rests at the Port Everglades, nestled in Broward County, Florida. It turns out its name is also incredibly fitting; once you step aboard, you’ll receive treatment befitting of royalty, without the royal price tag! Depending on the sights you’d like to see, rates for your cruise trip can sink as low as $350. The real treat, however, is the set of amenities bundled aboard the cruise ship. Guests can enjoy a vintage styled bar, which serves high-quality martinis, as well as a lounge dedicated to enjoying flavorful cigars and a Euro-themed casino. A number of restaurants also reside on board the ship so guests can enjoy a night of luxury dining. All in all, the entire cruises lasts approximately 10 days, giving you plenty of chances to sightsee and relax to your heart’s content and also making it one of the most popular cruises from south Florida. What could be a bigger name in the cruising industry than Carnival? 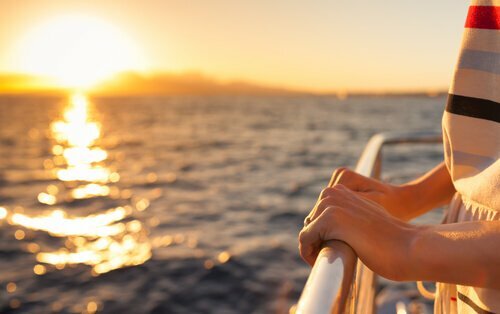 If the name alone appeals to you, you’ll be happy to know they offer amazing cruises from south Florida, with their main stop right in Ft. Lauderdale! With this cruise comes the chance to see and experience some of Ft. Lauderdale’s biggest attractions and see its biggest and most notable landmarks for yourself. You’ll be able to experience everything Ft. Lauderdale has to offer, including its unique shopping and dining opportunities, all at prices as low as $284. Royal Caribbean is another big name in the luxury cruise industry, making it a great option for your vacation. This particular cruise rests at the Port of Call in Miami, Florida. There you’ll be able to sample unique and delicious varieties of seafood, tour through Miami’s natural and cultural wonders and even go for a swim (or dive) within the Florida Reef! There is no shortage of fun things to do in Miami, and the city is so varied there’s sure to be something for everyone in your family to enjoy. These aren’t your only options for cruises from south Florida, but we hope this list will give you an idea of just what’s waiting for you to experience. Visit our blog to learn how else you can enjoy a great vacation in south Florida, no matter the time of year!